If a tumor is like a seed, the soil around it plays a significant role in its growth, a new study finds. According to the study’s results, the microenvironment of a tumor cell has significant impact on cancer metastasis. 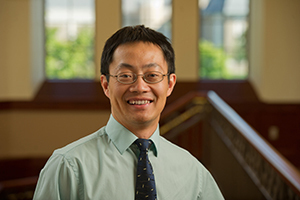 This discovery by Siyuan Zhang at the University of Notre Dame and a team at the University of Texas MD Anderson Cancer Center has focused attention on fighting cancer in the tumor cell’s microenvironment. Zhang’s laboratory now seeks to understand the mechanisms of the tissue-environment influence, opening the possibility that the environment could be altered in a way that fights cancer by preventing tumor cell growth. Zhang, the Nancy Dee Professor of Cancer Research, has published the breakthrough, “Microenvironment-induced PTEN loss by exosomal microRNA primes brain metastasis outgrowth,” this month in Nature. Originally published by Gene Stowe at news.nd.edu on October 27, 2015.